Even months later it is difficult to accept that had taken half a lifetime for me to experience a truly awful cup of coffee. In that chunk of lifetime I've had cups of coffee that were sludgy-dense and bitter. I've had coffee with grounds in it. I've been served cups of tepid, brown water. 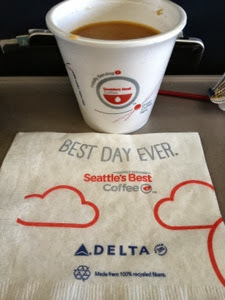 On that ill-fated flight to SLC, Delta was happy to serve me the worst cup of coffee I'd ever had, and I've had jail coffee. It was coffee that not only lowered the quality bar, it had drop-kicked it down a flight of stairs and into a deep, dark hole. The cup proudly proclaimed that what I'd drank was Seattle's Best Coffee. I'm now terrified of Seattle's worst. Terrified. My emotions are scarred like a crotch bathed in McDonald's hottest brew. As the flight attendant approached, rumpled, dry-lipped, and obviously working her way through a drunkover*, I tossed the cheerful cup of abomination into her waiting trash bag. With breath stinking slightly of cheap vodka and co-pilot, the attendant asked me if I wanted something else. I asked her if I could get something else ten minutes ago. Unamused, she carried on collecting trash and sweating booze as the plane continued on to our destination. My in-flight beverage on the return trip to Orange County was water, no ice. No coffee, tea, or you, thanks. I wouldn't drink coffee on a Delta flight again with a rented mouth. 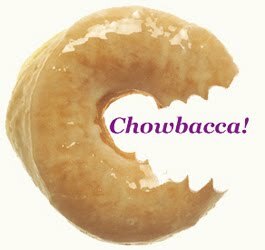 *The Chowbacca! Dictionary defines a Drunkover as still being drunk from the previous night well into the following day. Cheers, with shaky shots, to flight attendants everywhere! **Is your seat back forward?